This session consists of two modules with program support between modules. "With the 2x2 option, the Advanced Management Program is really 130 days long, when you include the time in between sessions. Returning to work in between sessions provided a great opportunity to reflect on what I learned in the first half of the program. When I came back for the second half, I cemented my knowledge." Hear from three past participants on their Return on Learning at the Advanced Management Program. The first two weeks of the Advanced Management Program 2x2 take place in the spring, concurrent with the consecutive four week program. Executives return to work after two weeks, and then continue the program during the second two weeks in the fall. Between the two sessions, executive participants start implementing their learning, receive coaching on their progress, and continue to develop designated personal and business projects. Via a virtual component, the class connection and community is maintained, and executives are able to share learnings, reflections, and progress. The 2x2 option allows participants to receive immediate feedback from colleagues, managers, and direct reports while back at work in between program sessions which they will leverage to further their progress with their program cohort, personal coaches, and faculty members upon return. At the end of the program, executive participants emerge stronger and more focused leaders, better able to develop and communicate their strategy and execute change. Address your Living Case, a unique opportunity to present and work through an organizational challenge you are currently facing, obtaining new perspectives from world-renowned faculty and your global peer set. Learn more about the Living Case in our program information downloads. For more about the program, download the program agenda, listen to the faculty and program directors speak about the experience, and hear about the return on investment from past participants. Return to your organization with an action plan for your Living Case, a business challenge you are currently facing that you work on throughout the program. Learn more about the Living Case in our program information downloads. Execute decisively by learning how to align the levers of the organization to coach and persuade for support around your goals. With the 2x2 option, immediately apply program takeaways in between sessions, allowing you to put learnings into action in real time. With the 2x2 option, return to your organization after the first part of the program to collect feedback from colleagues, managers, and direct reports, allowing you to act on their observations during the second half of the program. 100% say Columbia Business School Executive Education prepared them to address their business challenges. 96% say the New York City location of Columbia Business School Executive Education contributed to a unique learning experience. 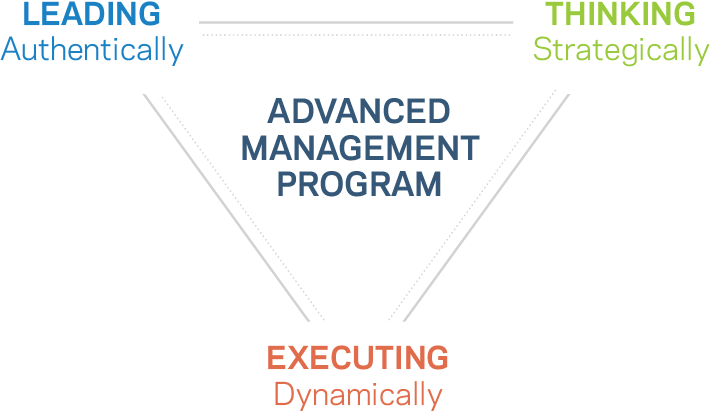 The Advanced Management Program 2x2 option consists of two, 2-week modules with program support in between. The first module takes place in the spring, the second in the fall. The program is also available in a consecutive four-week format. In both formats, accommodations are provided and included in the program tuition. For the first half of the program, Columbia Business School Executive Education has partnered with GE’s Corporate Leadership Center, located in Crotonville, NY on an iconic 71-acre campus. Participants stay at this top-class business facility — with accommodation, conference rooms, and dining all conveniently situated — allowing them to focus on learning, collaborating, and networking during the first two weeks of the program. For the second half of the program, participants stay in a five-star hotel in Manhattan. The program sessions for part two take place on the Columbia University campus and throughout Manhattan, immersing participants in the business capital of the world. The city becomes an integral part of the learning experience as we take you to inventive, inspiring, and informative locations throughout New York in a variety of program sessions. Take an inside look at the program experience. 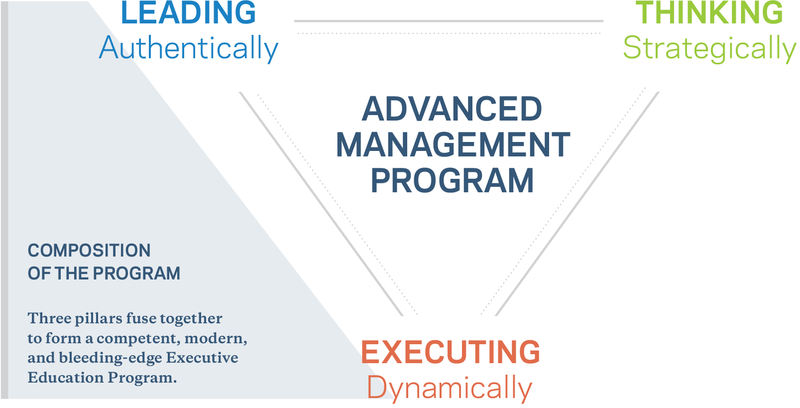 It’s this carefully curated and diverse curriculum that executives who have completed the Advanced Management Program have called "eye-opening," "empowering," and "transformational." The 2x2 option offers the same amazing curriculum, simply in a scheduling format that might better meet your demands. For an inside look at the Advanced Management Program 2x2 curriculum, download the program agenda. At the Advanced Management Program, your journey of intellectual, personal, and professional growth begins long before you arrive in New York and spans well beyond the last day of the program. From connecting with the program director and members of your executive cohort prior to the program start date to help you identify the organizational challenge you’d like to bring to the program to address, to multiple executive coaching sessions after you’ve returned to your organization, we’re committed to giving you professional development with a lasting impact. Through this short and impactful online exercise, you'll begin considering factors that may influence your return on learning from the program. You’ll start to hear from various faculty, get connected to members of your incoming cohort before meeting them in person, and begin to exchange ideas and objectives. Throughout the program, more than 50 faculty members, practitioners, and executive coaches led by Faculty Director Paul Ingram share their subject-matter areas of expertise to inspire and guide your journey to authentic leadership, strategic thinking, and decisive execution. With the 2x2 option, participants start implementing their learning between the two sessions and receive coaching on their progress. They continue to develop designated personal and business projects and maintain the class connection and community via a virtual component. They are also invited to participate in an online program on Globalization, led by Nobel Laureate Joseph Stiglitz, and world-renowned economist Bruce Greenwald. Three complimentary one-hour sessions with your Executive Coach support your success after your return to your organization. Learn more about executive coaching at the program in our program information downloads. Reconnect with the Program Director to help you maintain the trajectory of your work and help your progress as a leader. Access various virtual learning opportunities and leverage your Columbia Business School alumni benefits including the invitation to attend alumni events. The Advanced Management Program offers diverse and carefully curated sessions* to help participants create more organizational and professional value. Many of these sessions take advantage of our unique location, New York City, as a laboratory to study innovation, improvisation, and robust organizations. From Columbia University, we bring the finest, relevant, cutting-edge research so participants can engage promising ideas on improving performance before they become widely diffused. Below is just a sampling of what you will experience. For an inside look at the Advanced Management Program, download the program agenda. *The selection of sessions may vary from iteration to iteration and are subject to change. The 2x2 option format was launched to offer flexibility for those who find being out of the office for four consecutive weeks too much of a barrier for enrolling in the program. Paul Ingram is the Kravis Professor of Business at the Columbia Business School, and Faculty Director of the Columbia Advanced Management Program, Columbia’s flagship residential program for senior executives from around the globe. His PhD is from Cornell University, and he was on the faculty of Carnegie Mellon University before coming to Columbia. He has held visiting professorships at Tel Aviv University, Shanghai Jiao Tong University and the University of Toronto. The courses he teaches on management and strategy benefit from his research on organizations in the United States, Canada, Israel, Scotland, China, Korea and Australia. His research has been published in more than sixty articles, book chapters and books. His publications have received numerous distinctions, including Gould Prize, and best paper awards in the areas of Organization and Management Theory, and Collective Behavior and Social Movements. 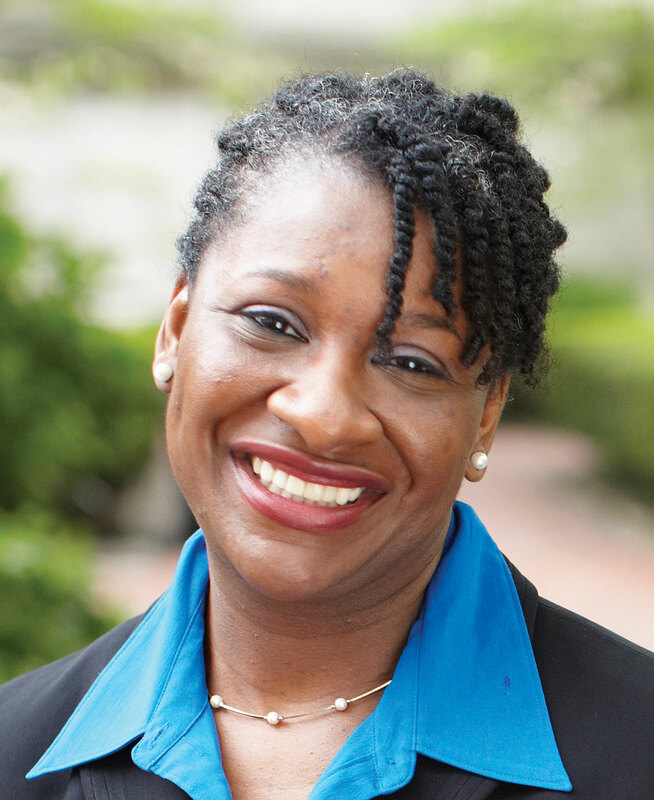 Ingram's current research examines the intersection between culture and social networks. Recent papers investigate questions such as the role of value similarity to foster business networks, determinants and outcomes of individuals’ fit in organizational cultures, and influences on ethical decision making. He has served as President of the College of Organization Science of the Institute for Operations Research and Management Science (INFORMS). He is currently an Associate Editor for Academy of Management Discoveries, and has served as a consulting editor for the American Journal of Sociology, a senior editor for Organization Science, an Associate Editor for Management Science and on the editorial boards of Administrative Science Quarterly and Strategic Organization. Paul’s undergraduate degree is from Brock University where received the Governor General’s Award as the top graduating student. In 2004 he received the Distinguished Graduate Award from Brock’s Faculty of Business. At the Columbia Business School, Paul has received the Dean’s Award for Teaching Excellence, won the Commitment to Excellence Award, voted by graduating EMBA students five times, and thrice been chosen by graduating EMBA students to deliver the keynote speech at their commencement ceremony. He has consulted on issues of organizational design and strategy to leading companies in the finance, health care, insurance, energy, and consumer products industries. Paul was born in Canada to immigrant parents and was the first in his family to attend college. As director of the Advanced Management Program, Bruce partners with the faculty director and the on-site and off-site Columbia teams, working with visiting faculty and conference center staff to deliver a transformational educational opportunity for the executive participants. At the program, Bruce teaches sessions on leadership, focusing on communication, defining purpose, flexible learning, effective messaging and the power of writing as a tool to face future challenges. In addition to his teaching and leadership roles, he has responsibility for the pre- and postprogram effort of the executive education team, including serving as an executive coach. Over the years he has taught and had a leadership role in a number of open enrollment and custom programs in the Executive Education portfolio. He has also been a visiting professor at the WHU Business School in Germany in 2013-2014 and the faculty director in 2016 of the one-week leadership program of WHU at the Columbia Business School. Concurrent with his work in executive education, his writing credits include a published novel, a produced screenplay, and a business case on the credit function of a building supply company for Columbia Case-Works. Ahmed Elsheikh says he saw AMP 2x2 as a three month program not four weeks. He created his own 100 day plan between the sessions to implement the learning he gained. Chairman at Structure Tone Inc.
James Donaghy says AMP 2x2's schedule made it possible for him to attend an executive program of this caliber. The break also allowed him put certain ideas to work immediately and also allowed him to reflect on other knowledge he gained. Rembert de Villa says the time between the first two weeks and the second two weeks allowed him to apply the concepts they learned including prioritization, alignment, and adopting a personal leadership style. Simon Browne says AMP 2x2 gave him a chance to use time between sessions to learn and apply the learning he gained from the 360 degree feedback and discuss what he had learned to his team. Kevin Toth talks about how the schedule worked around his demanding work and family responsibilities and also provided a chance for him to crystallize the concepts and put them into practice.